One of the best stories in sport is seeing the underdog triumph. Enrico Battaglin’s stage win at the Giro was one example, the conclusion to a thrilling stage with two riders from wildcard teams sprinting for the stage win against Sky’s Dario Cataldo. It took plenty but started with a wildcard invitation, the modest Bardian-CSF team isn’t guaranteed a start in any race. Europcar’s ejection from the World Tour and the merger of Cannondale and Garmin means only 17 teams have guaranteed entry to the top races. The other places can be given on an invitational basis. For the second division teams, officially labelled “UCI Pro Continental” teams, there’s no bigger prize than an invite to the Tour de France. Here’s a look at the candidates for an invite and the system as a whole. Decisions for an invite are due next month. Europcar’s situation isn’t certain. 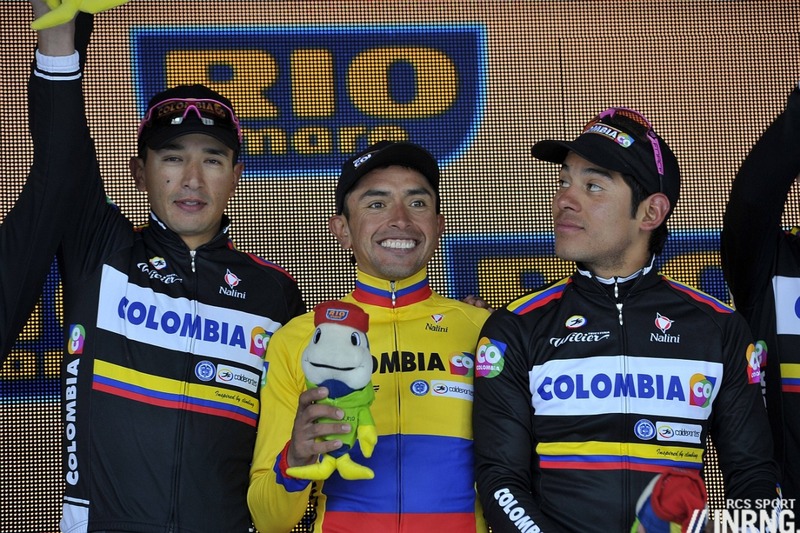 They’ve been refused a World Tour place but have not got a Pro Conti licence for 2015. This should be a formality but remains a concern, as hinted here before cutting back their budget won’t be easy. Cycling is different from other sports in so many ways and one further example is the racing calendar. First division World Tour teams get a totally different calendar than second division Pro Conti teams. This matters because the top riders can get used to riding grand tours, whether it’s the stamina of riding for three weeks, the experience of the high mountains or the managerial aspect like logistics or coping with grand tour cabin fever. 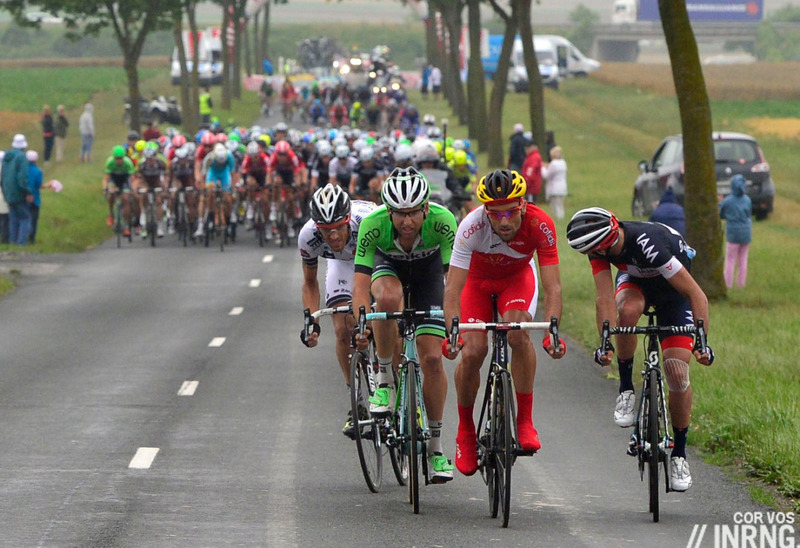 But Pro Conti teams can miss this; even those lucky to get a wildcard will only have nine riders in a grand tour. It all makes for a two-level cycling where the riders in the big teams accumulate experience and stamina while the smaller teams can’t, further reinforcing the gap so when a smaller team does get an invite it’s got a lot of catching up to do. Neri Sottoli, otherwise known as Fluo Yellow, should have a default invite as winners of the Coppa d’Italia but just as there’s a rule (11) to allow the team prize winner of this competition an automatic invite, there’s also another rule (13, unlucky for some) which says RCS can ignore the team if it causes damage to the race. Certainly the team’s wildcard invite last year was controversial and they’ve since had more doping scandals. Many will not want to see them at the race but race director Mauro Vegni seems keen to have them. Bardiani-CSF are the wildcard certainty given their Italian status and regular triumphs in May. The modest Italian squad had a great Giro last year. With Enrico Battaglin, Stefano Pirazzi and Sonny Colbrelli they can be certain of an invite. Androni-Venezuela are the third likely pick but it’s not an obvious choice. Expect Gianni Savio to wave the Italian flag vigorously to compensate for the lack of star riders and the Venezuela name. Franco Pellizotti should swing it for them but he’ll be 37 next May. Cofidis are assured of a place. They’re a World Tour team in all but licence; their budget is significantly bigger than Europcar’s. But as a Pro Conti team they aren’t obliged to race around the world, something that suits sponsor Cofidis which has operations only in Europe and primarily in France, Spain and Belgium. MTN-Qhubeka rode the Vuelta under the eyes of ASO. They’ve been on a hiring spree and with Edvald Boasson-Hagen, Matt Goss, Tyler Farrar and more the team has plenty to offer. Carefully placed stories – “Berhane dreaming of Tour de France start” – regularly link the team to the Tour de France although they might want more profile in L’Equipe to ensure they’re on Monsieur Prudhomme’s radar. The fifth pick isn’t easy and shows the value of a star rider to a small team. Samuel Sanchez is retiring after no offers of a contract but you can’t help wondering if his presence on a team would help to guarantee them a start, perhaps in the Vuelta at least? I’ve not covered the Spanish invites because they’ll come in the spring meaning there’s a chance for the hopefuls to impress with good riding in the early-season stage races. Both the Giro and the Tour are expected to issue invites during January. It means no chance for a team to prove itself in the spring but ensures squads have six months plan. Note the system has World Tour and Pro Continental teams but in reality there are three or even four divisions. We have the 17 World Tour teams as the first division. Then comes the second division where a band of teams can be sure of one or even two grand tour invites, think Cofidis, Europcar and MTN-Qhubeka. The third group sees teams with a possible invitation but they need some luck and some hardwork. Finally there’s a fourth group of teams knowing they’ll not get an invite to a grand tour in 2015 but happy to compete elsewhere, particularly in their local races, think Rusvelo, Topsport Vlaanderen, Drapac or Novo Nordisk. The second division is a big place. The grand tours are also national events and there’s a clear element of domestic preference. It makes sense because a race needs a high contingent of domestic participants. For all the talk of the Tour de France being a global sports event by far the largest TV audience segment is in France and most of the roadside fans are French and having a régional rider to cheer helps swell the crowds. But you can’t help wonder if the grand tours could bolster some longer-term planning. Rather than an annual scramble a clearer long-term path to an invite could help. Italy’s wildcard for the best team in the Coppa Italia could be replicated for the Coupe de France series although the danger is that you take these proud individual races and effectively relegate them to Tour qualifiers. There could be other incentives, a pledge to invite a team if it offers clear rider development options for example or a bonus/malus system so teams with a lousy image pay the price and sit out for a year. But all this places power in the hands of a race, the ability to issue invites confers power that the UCI might prefer to wield. Instead of leaving RCS and ASO to dish out valuable invites, what if the sport had a clearer promotion and relegation system? Development work, riding clean and other good things ought to be systematically rewarded. With five wildcard invitations instead of the standard four both the Giro and Tour have more choice to pick who they want. But the irony is that there’s less to choose from, the best riders have been snapped up by the big teams. They can fill three or four places with ease but the last spot isn’t such an easy call. For 2015, IAM’s promotion and Europcar’s ejection from the World Tour will have resulted in the sound of corks popping at Vini Fantini HQ as this opened the way for an almost certain Giro invite for the modest team which might not have arrived had the UCI ruled otherwise; but if they start the race, quite what they’ll do during the rest of the three weeks remains to be seen. But what if there was a more obvious path to an invite, a process rather than praying another team bungles its registration? The wildcard system offers the hope of a winning ticket to some teams but until there’s a clearer system of promotion and relegation it only entrenches the gap between the first and second division teams. Invites go out in July? It’s got earlier and earlier for the Tour, June in the past. In recent years it was April but January allows more planning. The Bora invite for July seems already certain to me. They delivered far above their weight in 2014, by sponsor change and riders transfers they became more “German” in the meantime (and Germany’s still an important market for ASO) and Prudhomme has been already present at the team’s presentation. These issues are why I’d prefer to see a (if they insist on having the damn thing) smaller number of top-tier teams. Perhaps 12 is enough? I still fail to understand what was so awful (except for the UCI coffers not filling with top-tier registration fees) about the old daze when (geez, it wasn’t that long ago that teams paid a registration fee to ride LeTour) the organizers could invite/accept whoever they wanted. A top-tier team now costs more than 20 million bucks? With F1 and MOTOGP suffering from exploding budgets to field a competitive team it would seem smart to lower the cost-of-entry by making it possible for more teams to be invited by the race promoters rather than less? Well given that in 2013 there were 19 World Tour teams, 18 this year and 17 next year this could be coming true (especially if the situation in Russia continues then Tinkov may be forced to sell his team – I could talk at great length about the geopolitical realities of Russia but will save it for another time). Then of course there are the UCI reforms which also want fewer top tier teams. And as for the majority of TV viewers being French, well would the addition of Bretagne-Séché to the starting line add any extra eyeballs versus what could come from Germany were the Tour de France broadcast on a major free to air channel there? Bora Argon-18 and MTN-Qhubeka riding would give the race much free publicity and most likely some extra viewers as well. ‘Them’ being Cofidis, I assume? Good article though. Greater competition for places at World Tour level would certainly be mirrored by less predictability in the wild card invitations, both of which would be good for the sport. If the sport were on stronger financial footing, it would be ideal to have an extended tour (2-3 weeks) for the Pro-Conti ranks that mimicked the grand tours in terrain, etc. Not only would it benefit the teams trying to get wild-cards to the grand-tours but would also help them to really develop riders who could make a smoother transition to the larger teams. I think they need more races in general where they can shine primarily amongst themselves. Since there are so few teams, they race either up a level (with the World Tour Teams) or down a level (with Continental and/or Amateur Teams). Have the UCI “require” the Grand Tours “offer” a non-representative region ( South America, Oceania/Australia, Asia, and Africa ) any non participating regions, without a participating WT or Pro-Conti team) be thrown into a lottery, one randomly picked to participate. Must have the $ to make it happen. Adds a bit of spice, exposure, new markets and new riders. Let’s hear it for Drapac! also for 2015 CCC signed Sylwester Szmyd who is going to try his own chances, and who rode many Giros along side of Ivan Basso – http://cccsport.eu/sylwester-szmyd-podpisal-kontrakt-z-ekipa-ccc/- for sure big card in their hands to play.